Career Capsule: Charlee Simons has been entertaining since the age of eight, putting on comedy shows for the neighborhood kids and any unfortunate dinner guests of his parents. No one was immune! Once Charlee discovered that he could actually get paid for it, he was unstoppable. After a successful radio and television career in the San Francisco Bay Area. Charlee went to work with Comedy Sportz International in Hollywood for a year where he honed his improvisational comedy skills. 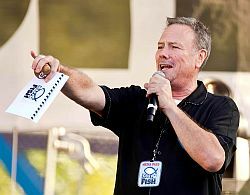 He has won several awards for his voice acting, voiceover, on-camera commercials, television writing, acting and producing (you can currently see his work on the Urban America Television Network’s show “411” and on his personal channel, http://www.youtube.com/user/charleesimons). Charlee is currently working as a radio and television personality for the Salem Media Group in Sacramento, California. Tell us what’s new at KKFS… news, changes, & with YOU… etc? I’ve been so happy working with Salem and feel greatly blessed to FINALLY be in Contemporary Christian music radio. 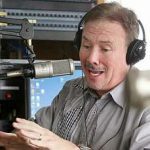 Being a native of California, I had a very successful career (by world standards) in the San Francisco Bay Area, then I got saved and couldn’t BUY myself a job in Christian radio or television after I was fired from my six figure income, double-digit rated (in several key demographics) morning show, all because I got saved. Seriously! Discrimination is alive and well if you’re a follower of Christ Jesus. After my third try to get work with EMF failed, I had all but given up on the idea. The closer I got with our Lord, the more my career seemed to be narrowing. Where could I find a job in secular radio that would not force me to compromise my beliefs with objectionable commercial and music content? After losing a great Afternoon Drive gig in Nashville for having a Christian pastor on my show to promote a local Baptist Church fundraiser (not kidding), and finding myself back in California, I was at the end of my mic cord! I had known the Program Director at 103.9 FM The Fish in Sacramento from working in a different Market early in our careers. He was well aware of my past success in media, and took a chance with me having zero experience in the CCM genre. What a learning curve it has been! I have had to rethink almost everything I ever knew about how to be a successful on-air personality, especially morning drive. Nothing, just be myself. Seriously, it is just that simple. I am completely honest and let my yes, mean yes, and my no, mean no. The Lord blessed me with a pretty decent sense of humor. I’ve known people funnier than I, but when it comes down to truly sharing their true life succeses, failures, conflict, doubt, and how the Lord has shone through the simplest things… they seem to be incapable of it. Absolutely! A rising tide lifts all boats! The bottom line for me is, it’s all bringing praise and glory to our Lord. What a glorious world it would be if EVERY station carried some sort of real Christian programming. Most likely the Church. Fewer and fewer Program Directors are the radio professionals I’ve always known. I’m getting to the point in my life where I’m older than many PDs. So many now are just glorified Music Directors who seem to hate coaching. Even if they did, they probably wouldn’t be very good at it. Churches, however, are having more MC’s and actors take an active role in worship. Either they’ll come up from there, or, if the current trend continues, every major company will have one central studio that is simulcast on all their frequencies. One staff for on-air. Period. Sad, but true. Watering down the message to please everyone. When we do that, the enemy wins that battle. That’s simple; RICK DEES on 102.7 KIIS FM in Los Angeles! The man dominated Los Angeles radio for 20 years. He was in several movies, many television shows, hosted the Nationally syndicated show Solid Gold. He had his own late night ABC network talk show called Into The Night with Rick Dees, started the very successful Weelky Top 40 syndicated radio countdown show, and even created several successful inventions. I had the honor of meeting and interviewing him twice, and was honored when he invited me to sit in on one of his shows. He even let me do the weather so I got to say those legendary call letters to his vast Los Angeles radio audience. He was funny, extremely gracious, generous, and always the consumate professional. I experienced it for myself, and heard the same opinion from everyone I’ve ever known who worked with him. Mr. Dees was also the only Major Market personality I ever heard say “May God bless you” at the end of every show. I adopted that same habit at the end of every show. Thank you, Rick Dees, for giving this kid a great example to follow as I started out my career by trying to sound EXACTLY LIKE YOU. If you’re going to “borrow” somebody’s sound and style, “borrow” from the best. HA!